The omnichannel thesis, a thesis that failed in an epic manner, has been rebranded as ... the "Customer Experience". One can look to Macy's to see how everything played out and now see how the thesis has evolved. Go read their annual reports, their 10-K statements (click here) ... you do this for all publicly traded companies in your industry right? Right?? I counted how often the phrases "omnichannel" and "experience" have been used in their annual reports. The counts tell us something about the rebranding of the failed omnichannel thesis. 2006 Annual Report = First Reference of "Multichannel" ... the original phrase that didn't work and had to be rebranded as "Omnichannel". 0 Mentions of Omnichannel, 15 Mentions of Experience. 9 Mentions of Omnichannel, 22 Mentions of Experience. 11 Mentions of Omnichannel, 20 Mentions of Experience. 30 Mentions of Omnichannel, 22 Mentions of Experience. Macy's brazenly calls itself "America's Omnichannel Store". 26 Mentions of Omnichannel, 23 Mentions of Experience. Sales = $27.9 billion. Oh oh. Growth is Ending. 31 Mentions of Omnichannel, 21 Mentions of Experience. 23 Mentions of Omnichannel, 22 Mentions of Experience. Labels annual report as "Agility to Adapt", introducing another failed buzzword. Sales = $27.1 billion. If omnichannel was so successful, why are they mentioning it less and why are sales now in decline? 23 Mentions of Omnichannel, 32 Mentions of Experience. Sales = $25.8 billion. 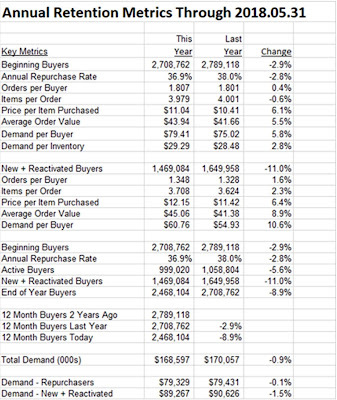 Sales in the omnichannel era are now down 10%. Just 12 Mentions of Omnichannel, 36 Whopping Mentions of Experience. "Peak Omnichannel" was 2014 ... sales of $28.1 billion. In 2018, "Experience" is mentioned 3x as much as "Omnichannel" ... the branding is complete and done for a good reason ... sales are $3.3 billion (yes, BILLION) less in the three years after "Peak Omnichannel" happened. When you listen to the "Customer Experience" thesis, you hear the same nonsense that you heard in the "Omnichannel" thesis ... great seamless/frictionless experiences across channels ... integrated marketing campaigns ... 360 degree views of the customer ... blah blah blah. Your job is to sell stuff ... not to adhere to a vendor-driven thesis that used to be called Multichannel and then was called Omnichannel until Omnichannel brands saw horrific sales declines and then was rebranded as Customer Experience because nobody can argue with providing a great Customer Experience, right? As a new Marketing Leader, you have to make a choice. Do you follow the failed vendor-driven Multichannel / Omnichannel / Customer Experience thesis that has to be rebranded every five years because it doesn't work? Do you follow the "Great Eight" and come up with a credible plan for your specific business? Get the booklet for $0.99 (click here) and get started doing the latter. A brand sends me a presentation deck from one of their vendors. One of the first slides outlines the average age of the customer base of the clients the vendor represents. The vendor was lying ... badly. In-house data showed that the average customer was 55-74 years old. Vendor data suggested the average customer was 35-64 years old. Obviously the vendor (a data broker) wanted to misrepresent the age of the customer so that they could make money off of the client. We don't talk about Customer Audience very much. However, your Audience is critically important. You see a lot of online brands starting catalogs - not understanding that their 33 year old customer couldn't care less about catalog marketing. You see catalog brands with a 66 year old customer hiring "influencers" who are reaching a 33 year old audience. And you see vendors who happily lie in an effort to make money for their business while sub-optimizing your business. Market to your Audience appropriately. Just $0.99 folks (click here). The new Marketing Leader has a short window to make a difference, to set a tone for the upcoming year or two. I took over a mess at Nordstrom in 2001. I had two vendors who were not meeting expectations. So I took my show on the road. I visited the first vendor. I was not impressed. The vendor couldn't have cared less that I was there. I could easily see why this vendor under-performed. Within a year, my team de-tangled themselves from the vendor. The second vendor didn't perform great, but the visit proved that they cared deeply about my business. As a result, I set clear expectations for the vendor. This vendor wasn't being led properly, and as a result the vendor made decisions that were not congruent with where I needed assistance. We eventually de-tangled ourselves from this vendor as well, but their performance improved enough to get us by for a few years. A new Marketing Leader needs to quickly identify if existing vendors are there for the long-haul, are "transitional vendors" who will ultimately be replaced, or are vendors that need to be fired. It's one of the most important things a new Marketing Leader does. I know, it's hard to believe somebody on Twitter was critical. You are dumbfounded. From 2001 - 2004, I hosted a day-long session with a terribly boring name ... called a "Vendor Summit". My key vendors paid their own airfare and hotel. In the morning, they heard from a member of the Nordstrom family, they heard from key Merchandising and Creative leaders, they heard from the Digital leader, and they listened as I presented where my team was headed for the upcoming year. In the afternoon, each vendor gave a 30-60 minute presentation. Some were spectacular, personalized for Nordstrom, full of research and facts and ideas. Some were downright awful, canned presentations featuring buzzwords and tepid ideas promoted by the vendor community in an effort to make money for the vendor community. I shared the concept with followers on Twitter ... and received a bit of criticism. "Not fair to put vendors through that and make them pay their way. Poor form. Bad way to treat a vendor." I never thought that I was being cruel. The intention was to facilitate a two-way conversation ... we'd share our plans, our vendors would demonstrate their knowledge, and the bottom vendor or two would expose themselves as not possessing the leadership necessary to help my team. It was the latter that the Twitter follower objected to. When you are a new Marketing Leader, taking over a broken department, you have to set a tone from Day One. It's important to teach your staff what a quality vendor looks like (quality performance + Leadership). It's also important to teach your staff what a sub-standard vendor looks like (tepid performance and minimal Leadership). The new Marketing Leader has a short window to set expectations ... for both employees and for vendors. Take advantage of the tools at your disposal. In modern marketing, you cannot achieve your goals without significant vendor assistance. Your vendors are an extension of your employee base. Get your digital copy of Hillstrom's Total Package for just $0.99 ... it's virtually free!! Remember what I call the "Great Eight"? The new Marketing Leader needs an answer to each of the Great Eight. The Anniversary Program is one of the hardest for my client base to wrap their brains around. There are at least three ways that Anniversary Programs pay off. First, customers typically possess an element of seasonality. The customer who buys Outerwear in October is often likely to buy Outerwear the following October. The smart marketer takes advantage of this fact. Second, customers who buy at Christmas typically buy at Christmas the following year. Everybody knows this and takes advantage of it, no need to spend more time on the subject. The third component of a credible Anniversary Program is an event that moves the needle. I experienced this first-hand at Nordstrom with their Anniversary Sale. Go look at their 10-Q statements and look at July sales. It's stunning. Nordstrom does Christmas business in July. Does your brand generate Christmas business in July? If you don't like the Nordstrom example ("Kevin, you are biased by your history, nobody else can do the kind of business you did, your example is unique and special, give us an example that is guaranteed to work for us, ok? "), then just look to Amazon Prime Day. Do you realize that the first Amazon Prime Day was in 2015? And today Amazon does Christmas-like business in July. If you are a credible marketer, then you have your version of Amazon Prime Day or Nordstrom Anniversary Sale. If you aren't credible, then you grumble and blame somebody else. The new Marketing Leader crafts an Anniversary Program plan from DAY ONE. This is purely a marketing-driven endeavor, so it's on the marketer to get something credible done early in his/her tenure. In the booklet, I ran a Life Table for customers after a 1st / 2nd / 3rd / 4th purchase. 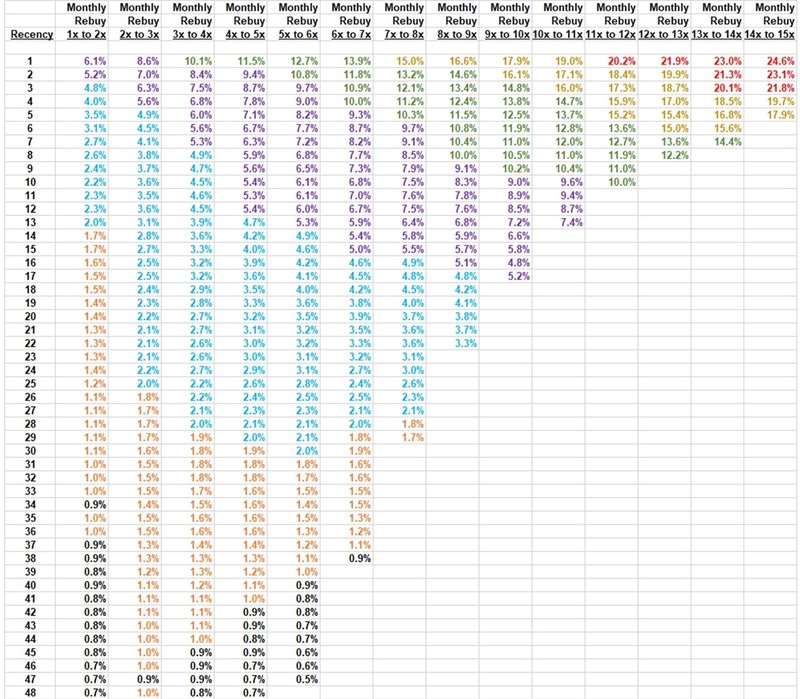 Look at the first three months, across the board. This is the time when you have to get the customer to repurchase, period. A new Marketing Leader implements a credible Welcome Program from DAY ONE. It's almost irresponsible not to implement a credible Welcome Program. Just as important - the new Marketing Leader communicates to every single employee why Welcome Programs are critically important. We've talked about Audience and Awareness, with the latter being particularly important and frequently ignored. Almost everybody has a credible Acquisition program. It's not like there are companies who don't know how to leverage Search, or Facebook. Most folks don't want to use TV or Radio or Billboards, but that's a personal preference thing. You've got the retargeting folks hounding you and watching your every more at every step, many folks do this of course. In other words, Customer Acquisition isn't something that you do and other people don't do and therefore you have a competitive advantage. What most people don't understand is the relationship between customer behavior and customer acquisition. Let's look at a couple of examples from the booklet. Check out this image, showing annual customer behavior. 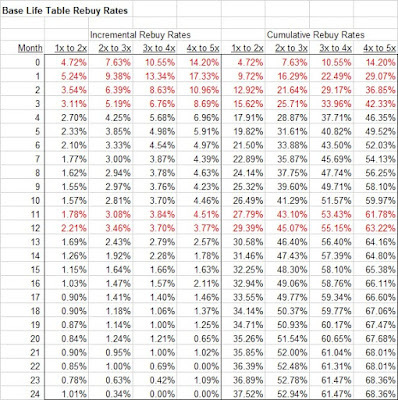 First, look at the annual repurchase rate - it is 36.9%. This is where you are going to disagree with me (you always disagree with me on this topic, and I know this because I've received your feedback over a dozen years) ... but this company is NEVER going to have loyal customers, and is NEVER going to push the annual repurchase rate north of forty percent or forty-five percent. Given that this brand is never going to move the needle like a Starbucks might, the new Marketing Leader already knows what the #1 priority has to be ... it has to be Awareness + Acquisition. Period. Not Loyalty. Nope. No. Next, you look at how many new customers are being acquired today and what impact it has on the business. You run your five-year forecasting simulations, right? RIGHT?? The new Marketing Leader should immediately make Customer Acquisition priority number one - no questions asked. She needs to teach ever Executive Team member why Customer Acquisition matters so much. In this case, Customer Acquisition matters so much because without a significant increase in new customers this business is going to slowly die. The new Marketing Leader needs to run scenarios on DAY ONE - scenarios that show what must happen if the business is to grow at a healthy rate. A scenario like this one, for instance. This company needs to increase new customers by 23.5% in the NEXT YEAR ALONE if the brand wants to grow by at least 5%. And that's what the new Marketing Leader must get everybody in the company aligned to do. Everybody has an Acquisition Program. Not everybody knows what they need to do from an Acquisition standpoint. 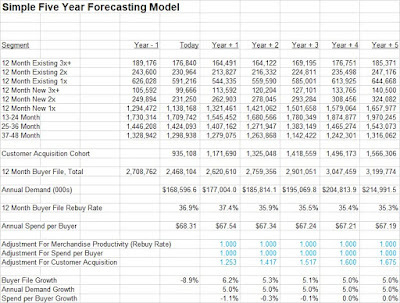 Show of hands - how many of you pair the five-year forecasts with your Acquisition strategy? I've been talking about this for twelve years, and yet it's much more common to not have the forecasts than it is to pair the forecast with strategy. The booklet goes into details about Lifetime Value (hint - it wasn't sufficient for this brand to drive huge Acquisition gains, which really puts the new Marketing Leader in a dilly of a pickle). Your Acquisition Program includes all the basic aspects of Acquisition that you already employ coupled with five year forecasts and Lifetime Value. Buy the booklet and learn more about the topic, ok? Today we talk about Awareness. In less than a paragraph, describe how a shopper who has never heard of your brand before learns about your brand? If your answer is any of the answers below, you don't have an Awareness Program. Mail a Catalog via a Co-Op. The new Marketing Leader needs to quickly (within 30 days preferably) establish the Awareness Program (and associated costs) she will implement. The best Awareness Programs are low-cost / no-cost, or are mid-cost but generate large quantities of prospects. Read what companies like Stitch Fix, Duluth Trading Company and Wayfair say about Awareness ... you'll hear comments about large quantities of new customers who are not tracked ... if your Customer Acquisition program tracks everything, your Awareness program is worth nothing. Content brands and Vendors are soooooo much better at Awareness than are most of my client base. Think about a company like Civic Science - an individual on Twitter said I had to get on their email list, and I could only do that by sending an email to the founder. Ok. I did that. A recent email campaign referenced a Forbes article (click here) which I'm reasonably confident wasn't authored out of goodness of heart. From the email campaign, you can see research - not everything of course (click here), but something. When you get to the research, you can participate yourself ... and you can sign up for various email campaigns. Vendors / Content brands are very good at Awareness Programs. Many in my client base have an opportunity to implement Awareness Programs. Look to the B2B folks for inspiration. The new Marketing Leader needs to have an answer for each of the Great Eight - preferably on or before DAY ONE of her tenure. Audience: Let's pretend that the new Marketing Leader is the online marketing guru at a catalog brand (this is so common these days). The person knows nothing about catalog marketing, and has been executing online marketing against a generally older audience. Does the new Marketing Leader want to ride this Audience into the sunset? Or does the new Marketing Leader want to harm short-term productivity while trying to start building the future of the brand? The Audience argument should be decided the day the new Marketing Leader is hired, and the argument should be led by the new Marketing Leader. If not, then somebody else is dictating the marketing strategy of the brand, somebody who isn't a marketer. That's not a recipe for success. Buy the Kindle version for just $0.99!! I worked with a new Chief Marketing Officer. This poor dude was in OVER HIS HEAD! He had no reporting to tell him what was really happening with his company. He had one (1) analyst, and the analyst was not qualified to help the CMO. The analyst had pre-conceived ideas for how to "target" customers, and spent all day experimenting with different targeting equations. When I sat down with the analyst, I could easily see that the analyst new nothing about marketing other than targeting equations. He sounded a lot like me in my first year at Lands' End. However, he had a job one or two levels higher than my first job at Lands' End. The CMO had an adversarial relationship with the merchandising team. I sat in a meeting where the merchandising team absolutely mulched the CMO. "You're the reason sales are down, you have no idea how to attract the right audience for what we sell!" was a direct quote ... and interestingly, the CMO had been in the job for maybe three or four months and was not working at the company when the sales downturn happened. My time with the company ended a few months later when the CMO and the Analyst lit me up on the phone about the fact that merchandise productivity was poor. "You should fix this problem, this isn't our fault" was the quote I remember the CMO issuing, with the Analyst piling on for effect. Clearly, the two of them were transferring the assault they received from their marketing team on to me. My work was done on that day. The CMO was fired a few months later. The Analyst kept working at the company. It has been my experience that too many new Marketing Leaders have no idea what they are in for. They don't do the proper research before taking the job, they don't have the proper analytics when they begin working (i.e. Google Analytics gives you the wrong metrics to diagnose the true problem), and they don't know what levers to pull to move the business forward after they've been employed for a few months. 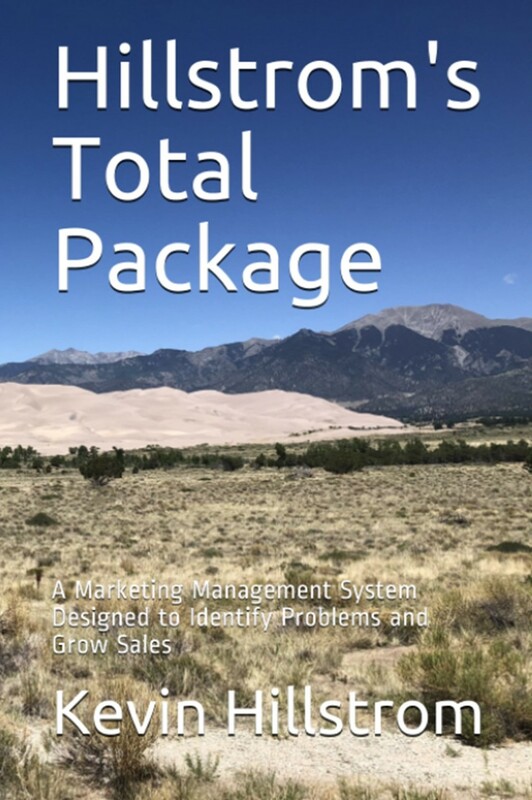 Hillstrom's Total Package teaches a process for the new Marketing Leader to implement on Day One of her tenure. Give the booklet a read (again, the Kindle version is just $0.99), and then start your tenure as a new Marketing Leader the right way ... be informed before you make decisions, ok? Get your own copy for just $0.99! When I became Vice President of Direct Marketing at Nordstrom, I was fortunate. I was given a bunch of data in the week before I started working there - after signing an agreement of course. I was able to discern that Merchandise Productivity was down about 25%. Have you ever tried to turn around a profit-and-loss statement ($300 million sales, $30 million loss) on flat productivity? That's hard work! Now try doing that when Merchandise Productivity is down 25%!!!! By having access to the data before Day One, I was able to craft a plan to generate $9,000,000 in profit on Day One ... the first year would be about fixing lots of marketing problems while the merchandising team fixed their issues. 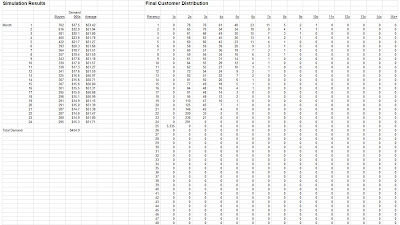 Incomplete View of Customer Behavior (Catalog, Online, Retail). 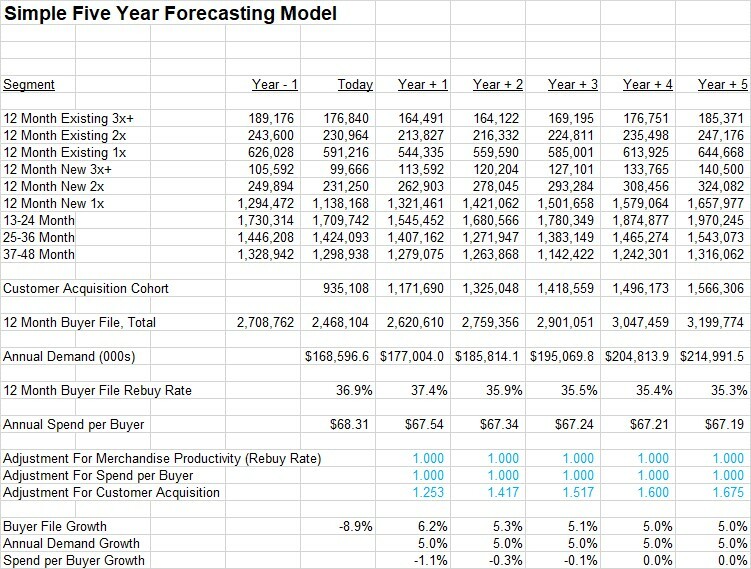 Knowing that Merchandise Productivity was a huge issue, my team and I authored an annual marketing plan that allowed us to keep the wheels on the bus and actually increase profitability on a reduction in Merchandise Productivity. The merchandising team did a fabulous job of digging out of a huge hole. The online team did a great job of transitioning customers from catalogs to online shopping. The inventory team didn't buy too much merchandise, and as a result, unprofitable liquidation activity evaporated. And a new customer database was installed twenty-one months later. Our Executive Team fixed the problems. It took two years to get to break-even, and nearly four years to post healthy profit. But ten months into the turnaround, the Chief Merchant and I were struggling to keep our job(s). When business isn't great, the Marketer or the Merchant are on the chopping block. I'm trying to prevent you from being on the chopping block. I had a process, a process based on my experiences at Lands' End and Eddie Bauer. The process allowed my marketing team to know what was truly wrong with the business from Day One, and to make profitable changes that protected the Marketing Team. There's a reason that Marketing Leaders frequently flame out after two years ... they don't know what, exactly, the true problem is. In this booklet, I share analytics and a process. The combination of analytics/process allow the new Marketing Leader to know what the problem is, exactly, enabling the new Marketing Leader to get a head start on fixing the business while protecting his/her job. Looking across e-commerce, there's something interesting and fun going on. A new generation of Marketing Leaders are being put in charge of marketing. Nine years of reasonable business performance coupled with a large generation of newly minted marketers learning mobile techniques yielded a cohort of smart people who have worked their way up to the Director / Vice President level. These folks deserve a better outcome than the generations that came before them. It's been 21 years since I became Director of Circulation/Analytics at Eddie Bauer - my first marketing job where I allegedly had responsibility for a budget (about $150,000,000). I lasted two years in the job before I tried something different. At first, my problem was the team I inherited. They weren't thrilled that I was their boss. As one individual said, "you don't know anything about this stuff, so I guess we'll have to teach you so that you can look good." Zing. Fortunately I had run many of the analytics outlined in Hillstrom's Total Package (Click here to purchase on Amazon). I knew what I was up against. I inherited a complete mess, one that took two full years to rebuild. The analytics in the booklet helped a few of us put the business on the right path. The analytics surfaced key merchandising issues that we (well, not me) were able to solve. Two years later we were posting record profit. Now, if I didn't have the analytics and processes outlined in this booklet, I'd have gone down a different path and I'm not confident the business would have been fixed. Business would have been better, but not fixed. New Marketing Leaders are put in bad places. They're typically asked to fix a situation that needs to be fixed by the merchandising team and/or creative team, and when the problem isn't fixed by the merchants / creative team, the marketer gets blamed. Worse, the marketer is typically fired, and another inexperienced and unprepared Professional is thrust into a no-win situation. I do not want to see that happen to a new generation of Marketing Leaders. We have highly bright individuals with endless e-commerce and mobile skills moving into situations where they have to fix problems that are not their doing nor are anything that the new Marketing Leader has control over. This booklet outlines a process I developed during my tenure at Lands' End and Eddie Bauer ... the process was used far less at Nordstrom for obvious reasons (discussed in the booklet). In the past three years, I increasingly see Marketers who are put in bad situations, and are then blamed for problems that aren't of their own doing. By reading this booklet, the new Marketing Leader can set the organization down a "path of accountability". 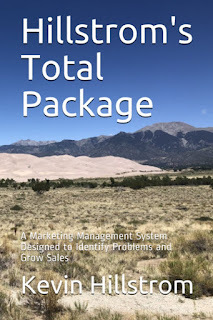 Yup, it's time for another booklet, this time including 80+ pages of goodies for the New Marketing Leader ... it's called Hillstrom's Total Package. Let's talk for a brief second about pricing before the complaints begin, ok? The print version is $14.99. This means that I make $2.26 and Amazon makes $12.73. The most common complaint I get about these booklets is that they are "too expensive". Well, if I lower the price to $12.99 I make $1.00 and Amazon makes $11.99. Go any lower and I make no money and Amazon gets everything. So the price is $14.99, and if you don't like that fact then I have good news for you. The Kindle version of the booklet is $0.99. Yes, you heard that right ... $0.99!!! On the Kindle platform, there are two different pricing options. The first option is to price the booklet at $2.99 or higher and earn a 70% commission. If I charged $14.99 for the booklet I'd make $10.49. The second option is to price the book at an extremely inexpensive price point and earn a 35% commission. So I'm conducting an experiment. I'm pricing the Kindle version at $0.99 and I get a whopping $0.34 while Amazon gets $0.65. And yes, I get it, some of you will say that this is dumb and I should just give the pdf away. Readers always have opinions ... and Amazon will always get the money. Now it is time for you to act. If you have a spare dollar, use it, buy the Kindle version and tell every person you know to buy the Kindle version and let's see if the reader hypothesis of "Low Prices on Booklets" can be verified or proven wrong. Tomorrow, I'll begin sharing what is in the booklet and will describe why you, the New Marketing Leader, should buy it. Marketing is blamed for the decline in productivity. Marketing does not have the proper tools in the toolbox to fix a merchandising problem. Therefore, marketing enacts all methods of discounting ... including free shipping, 10% off, 20% off, 30% off, 40% off, 40% off plus free shipping, and the classic ... loyalty program points. The customer attracted to discounts, promotions, and loyalty points becomes "the customer" ... in other words, a self-selection occurs where the customers who love various marketing programs are more likely to respond to the programs, and/or prior full-price customers become discount-centric buyers, and once that happens, the customer is less likely to go back to full-price purchasing activity. The brand is paralyzed ... locked into discounts/promotions without a solution for the merchandise productivity problem. You'll tell me that discounts are unavoidable - they're a competitive tool you are forced to use. Ok. So if we assume you cannot get out from under 30% off plus free shipping, and you cannot improve merchandise productivity, then we have to realize that "something" needs to be done. So look at the table above. Do you see the color bands? The color bands represent customers with comparable monthly response levels. The color bands demonstrate customers with comparable behavior. Look at the purple band. 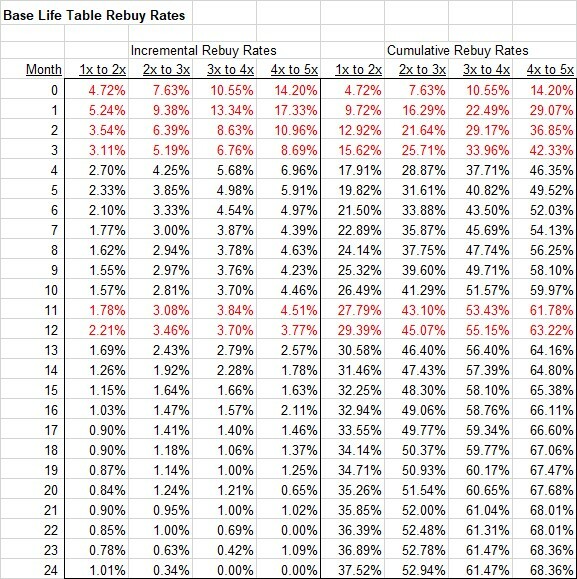 These are customers with monthly response rates between 5% and 10%. That's a pretty good level of responsiveness! When a customer becomes loyal, the customer is responsive, and the customer can be moved somewhat. When a customer is a first-time buyer, the customer is responsive for a brief period of time. We owe it to our businesses to do something about this short timeframe. There are more customers in these three segments (first three month after a purchase) than there are in any other segment. We can use discounts to influence these customers, sure. But maybe we need to have a Welcome Program that helps grow our customer base before the customers lapse and we have no choice but to use discounts/promotions as our only lever. 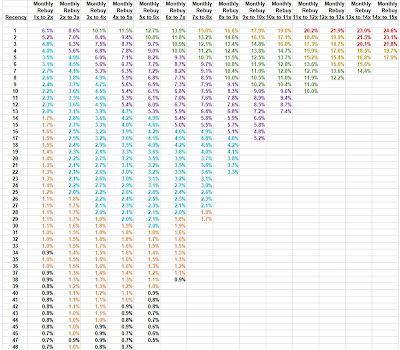 Ok, I ran a scenario where I improved the response of every 13-24 month buyer by 15% each and every month. This is different than increasing response by 15% for first-time buyers. We can probably agree that this is a much more aggressive strategy than something that impacts first-time buyers for just three months, right? Fortunately, the outcome is about similar to a Welcome Program that increases response by 15% for months 1/2/3. Darn near identical, in fact! That's good news, because an awful lot of energy is spent trying to convert lapsed buyers. That's good news, because it demonstrates that Welcome Programs can be at least as effective as lapsed buyer programs. Most important - the simulations demonstrate that our businesses have a "set process" in place in terms of customer relationships. The customer is going to do what the customer is going to do. Allow me to repeat that statement. "The customer is going to do what the customer is going to do." This is why I strongly encourage all of us to work on acquiring new customers. If we want more loyal customers in the future, we need more new customers today. I created a simulation that allows me to analyze how customers within a cohort distribute over the next twenty-four months. The image here - and yes, I get it, the numbers are tiny and hard to read - shows how a cohort of 10,000 first-time buyers migrate and evolve after twenty-four months. After twenty-four months, 5,474 of the first-time buyers in this specific example did not repurchase, meaning that 4,526 first-time buyers did purchase. 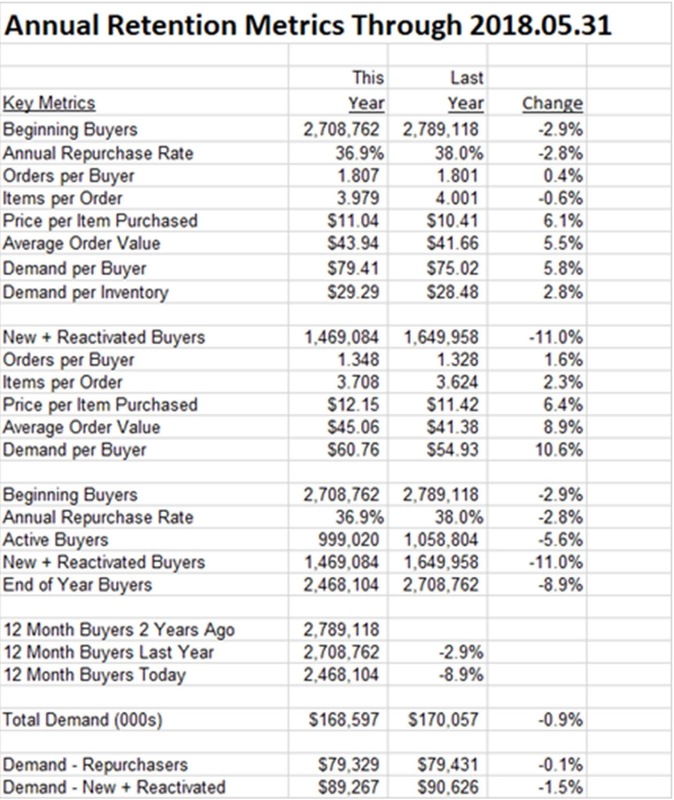 Look at the tiny quantities in all other cells beyond 1x buyers with Recency = 25 months. There's a version of diaspora that happens here, right? 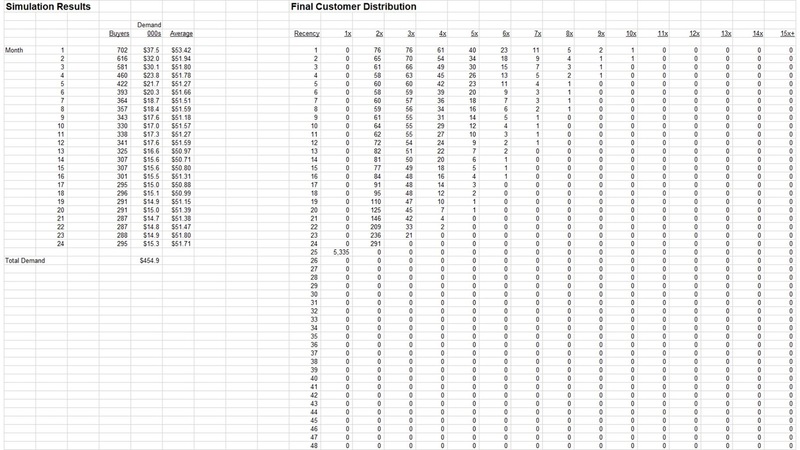 Most of the customers stay within the original cohort, while those who buy move out into 2x segments (2 purchases), 3x, 4x, 5x, heck, one customer made it all the way to a 10th purchase. That customer is loyal!! How would you define a loyal customer? Would you suggest that customers who purchase for a fifth time are loyal? Some would, some wouldn't! In our example (not shown), 264 customers make it to a 5th purchase, 114 to a 6th, 46 to a 7th, 17 to an 8th purchase, 6 to a 9th purchase, 2 to a 10th purchase, and 1 to an 11th purchase. In other words, not many customers become loyal. In total, this cohort of 10,000 first-time buyers generated $437,200 demand over twenty-four months. Knowing that, you have a pretty short window to impact customers. Impact them when they have just purchased ... for the first time. Tomorrow, we'll take a look at the impact of moving customers along quickly within this specific simulation.